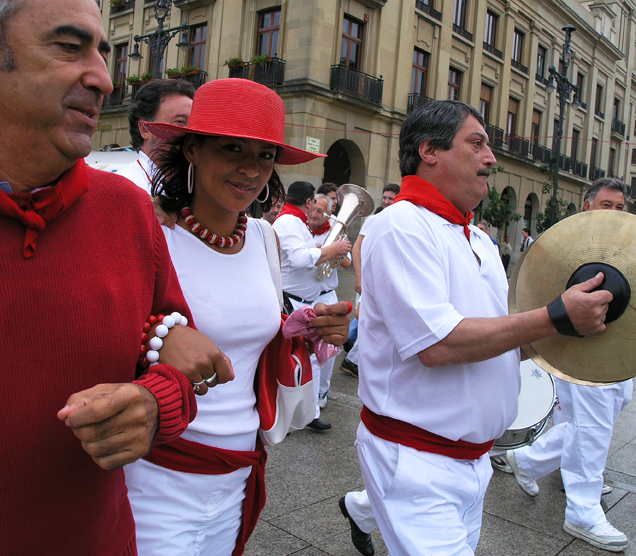 In the San Fermin fiestas, the day starts with the music of the Dianas or early morning reveille. At 6.45 am, the La Pamplonesa municipal band is ready to march through the streets of the Old Part, playing the familiar songs of the Dianas, to wake-up the local inhabitants. Other participants include military bands, groups of pipers and Txistu (Basque flute) players . All these bands play their energetic melodies through the streets before returning to the Town Hall at day rise. This is a more than one hundred year old tradition. The "El Eco de Navarra" newspaper was the first to suggest this idea of awakening the city's inhabitants with the tunes played by a band marching through the streets an hour before the bull running. The Town Hall thought the proposal was a good one and, in the early morning of 7th July 1876, the first Dianas were played during the San Fermin fiestas. The band of musicians was then the Meca, the popular name for the charitable organisation La Casa de la Misericordia. This band played alone for two years before it was joined two years' later by the Military band of the Gerona regiment, and then in 1880 other military bands also joined in. It was not until the 20th century, at the end of the sixties, when the Dianas were played by the municipal band La Pamplonesa, together with the military band, Txistu players and pipers. The turn of the century also brought a change in the repertoire of this morning event. The "popular tunes" played in the 19th century were cut down to four in the 20th century: "one" "two""three" and "four". These were anonymous tunes which were put to music by Silvano Cervantes. The "two" was the first to be played in the Dianas which was given the title "Aurora" (dawn). At present the Dianas continue to wake-up the inhabitants at the start of a new day of festivities. For all those participating in this early-morning concert, hot broth is distributed before the start of the bull running. 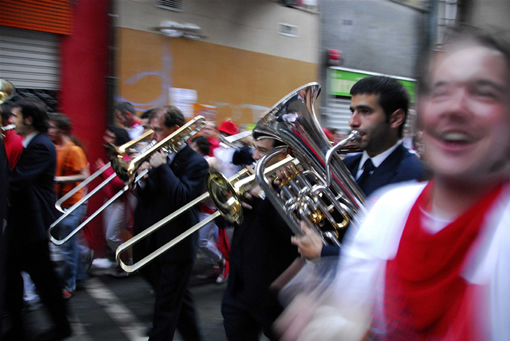 The San Fermin fiestas would be unimaginable without the music which forms the sound track to the festivities. Some of these compositions have become famous beyond the borders of Navarre. This is the case of the Dianas, and the popular chorus "Quinto levanta, tira de la manta ...". All these cheerful tunes are military in origin. The La Pamplonesa band generally starts by playing the Dianas: the one, the two the three and the four, this latter tune is also called La Gacela (Gazelle). Surrounded by people participating in the event, singing the tunes. From the Town Hall square a good number of spectators accompany the musicians as they march through the streets. People join in with the choruses of all these well known songs “'Churros, churros”and “Todos los curas suelen venir...”. More and more people gradually join the crowd following the musicians as they wind their way through the streets of Navarrería, Pozoblanco, Zapatería, Calceteros, Recoletas, Taconera, Mañueta and others in the old part of the city. The band plays music unceasingly as requested by one person or another, as soon as a piece comes to an end. People ask for songs with no rhyme or reason "the three", "the five" and the band members try and comply within their possibilities. The Dianas are rather like an improvised concert, with an atmosphere of good humour, preparing for the day which is about to begin. After completing the circuit, which varies from day to day, the group returns to the doors of the Town Hall.